I have had a craving for something starchy. I searched my pantry…nothing. Next stop, the fridge. Still nothing. I would have to make something, it seemed. But what? And then, the aha moment. Creamy Rice Pudding. The only issue was that I had to wait an hour before I would be able to satisfy my need for starch. What do I need to make Creamy Rice Pudding? 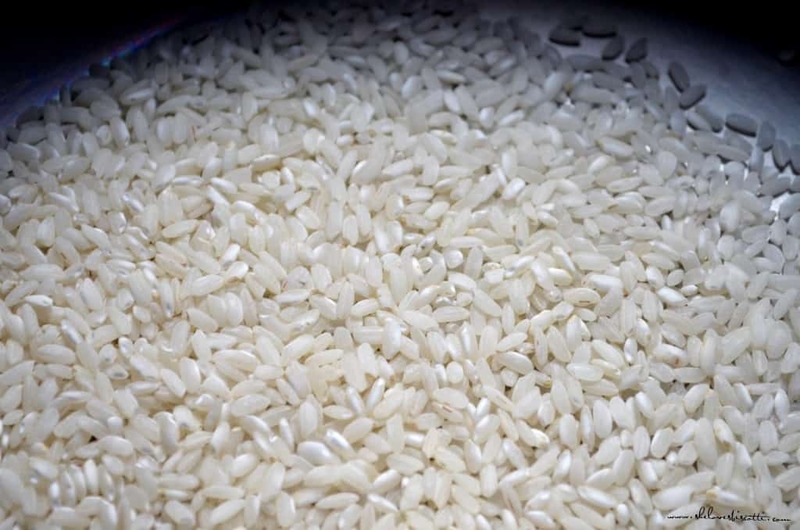 Arborio rice. This type of rice is responsible for that perfect creamy rice texture. Milk. You will be surprised when you taste how creamy this rice pudding is with only 2% milk. Sugar. A minimal amount to provide the right amount of sweetness. Vanilla bean. You are going to love the visual effect of those tiny seeds, not to mention the flavor! As far as kitchen accessories are concerned, you will need a wooden spoon and a medium-sized pot, preferably with a heavy bottom. That’s it! With only a few key ingredients and one pot, it’s really simple to make this creamy rice pudding. A medium or short grain rice will make a huge difference in the final product. Personally, I prefer the Italian short grain rice, arborio. It has a high starch content which lends itself perfectly to dishes where a creamy texture is desired. But don’t take my word for it. Experiment and see for yourself which grain you prefer. Combine the rice with one liter of milk, a little bit of sugar, a pinch of salt(optional) and set the whole thing to simmer over low heat for about 50 minutes. You need to stir every 10-15 minutes or so and before you know it, the mixture becomes super creamy. Once you get the consistency you want, add the seeds of half a vanilla bean…and just like that, a craving for starch is no more. The use of 2% milk will result in a healthier version of this rice pudding when compared to using either whole milk or whipping cream. The total amount of saturated fat is low when compared to a recipe that includes eggs, whipped cream or even whole milk as part of the ingredients. Be patient. Do not increase the heat hoping this will reduce the total cooking time. Go slow and low and you will be rewarded with a wonderful rice pudding. In the beginning, be sure to stir the mixture every 10 minutes or so to prevent the milk and rice from scorching. During the last 10 minutes, stay close to the pot and keep stirring every few minutes to prevent your rice pudding from sticking to the bottom of the pot. Arborio rice will provide you with the best texture. This homemade rice pudding will firm up once it has been chilled. It can easily be returned to its creamy state by adding a few tablespoons of milk, stirring and slightly heating the mixture. Can you make rice pudding with cooked rice? Yes, but the end product will not be as creamy or as tasty when comparing it to a rice pudding made from scratch. Do you refrigerate rice pudding? Yes, once it has cooled down, refrigerate in an air tight container. Consume within 5 days. Can you freeze rice pudding? Yes, use a freezer friendly container, label and use within a 3 month period. I adapted this recipe from a Canadian publication called Homemaker Magazine Recipes. In most recipes, you can usually decrease the total amount of sugar used without making a big difference in the final product. That’s what I did for this recipe- I reduced the sugar. I also eliminated the raisins (as my family is not fond of them), and used a vanilla bean instead of vanilla extract. I am convinced that it’s these tiny little vanilla seeds which provide the sensation of comfort in this Creamy Rice Pudding. Feel free to add-in raisins, cranberries, or even nuts to satisfy whatever you might be craving. Perfectly flavored with a vanilla bean, this extra Creamy Rice Pudding made with arborio rice is the ultimate comfort food. ★★★★★ If you have made this recipe for Creamy Rice Pudding, I would love to hear about it in the comments below and be sure to rate the recipe! Perfectly flavored with a vanilla bean, this extra creamy rice pudding made with arborio rice is the ultimate comfort food. Simplicity at its best. Combine rice, milk, sugar and salt in a medium saucepan. Heat until just beginning to boil, stirring often. Reduce heat to low, cover and simmer for approximately 50 minutes or until thick and creamy. Stir every 10 minutes or so. Gently stir in the scraped vanilla seeds or extract. Can be served warm, room temperature or chilled. This rice pudding will firm up once it has been chilled. It can easily be returned to its creamy state by adding a few tablespoons of milk, stirring and slightly heating the mixture. I have the original little Homemakers magazine with this recipe! Been using it for over 2 decades now and I don’t dare try another. Perfectly sweet and creamy. I’ve made double batches because it goes so quickly with our 4 kids. We love it sprinkled with cinnamon and a dollop of whipped cream. The measure for the sugar has been accidentally left off — it’s 1/4th of something, maybe 1/4th of a cup? I also reduce the sugar in most published recipes, usually by 1/3rd of the original quantity to start out with, and then I tweak it to taste. I also am not fond of raisins – the only recipe I can handle a FEW raisins in is stovetop oatmeal. I am a first-time visitor to your site and am enjoying looking at all your baked-goods recipes. Yummy. Congratulations, I’m adopting this site when I need a recipe….Great job. Thank-you so much! That’s wonderful to hear 🙂 Thanks for taking the time to comment.